Do it yourself A/C Repair tip #1 – To better understand your air conditioning system and how to do some easy at home a/c repairs you need to understand the basics of how an air conditioning system works. 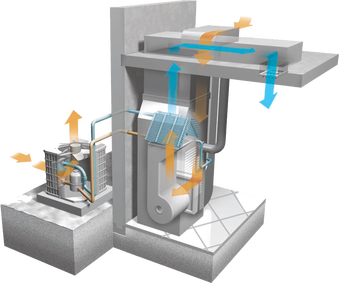 Because we live in Texas and more often than not we need cooling, we will discuss how the cooling operation works. It all begins at your thermostat. Once the thermostat reads that the temperature that you requested is not the actual temperature of the room, it will complete a circuit that sends information to a circuit board in your furnace that calls for cooling. At this point, the circuit board completes electrical pathways to both the outside condensing unit and the blower motor inside the furnace housing. 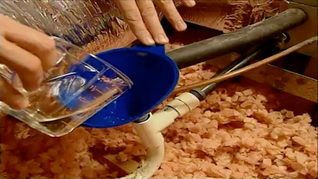 Air begins to circulate throughout your home using the ductwork to travel and move. Refrigerant also begins pumping from your outside condensing unit through copper lines into your evaporator coil. The warm air that passes across the evaporator coil gives up the heat and moisture it contains and becomes cold. The refrigerant is then pumped back to the Condensing unit and is “condensed” and the cycle continues in this fashion until the thermostat reaches the set temperature. With this many moving parts it is a wonder that air conditioning systems don’t break down more often! Find where your emergency drain line terminates. You can usually find the drain line somewhere above a window outside under the roof. It is important to check it on occasion for water dripping. If you have trouble finding it contact Ken’s Heating And Air for assistance. Ask your contractor if there is a place for you to treat your drain line with bleach that will help clear the algae build up. Don’t Wait! If you find dripping or excessive water you may have a drain problem and should contact your local air conditioning company quickly to resolve the issue. Ask your contractor on their next maintenance visit to label the light switches in the attic that clearly indicate which switch controls the lights and which controls the power to the furnace. If your air conditioning system is not operating check the switch in the attic.